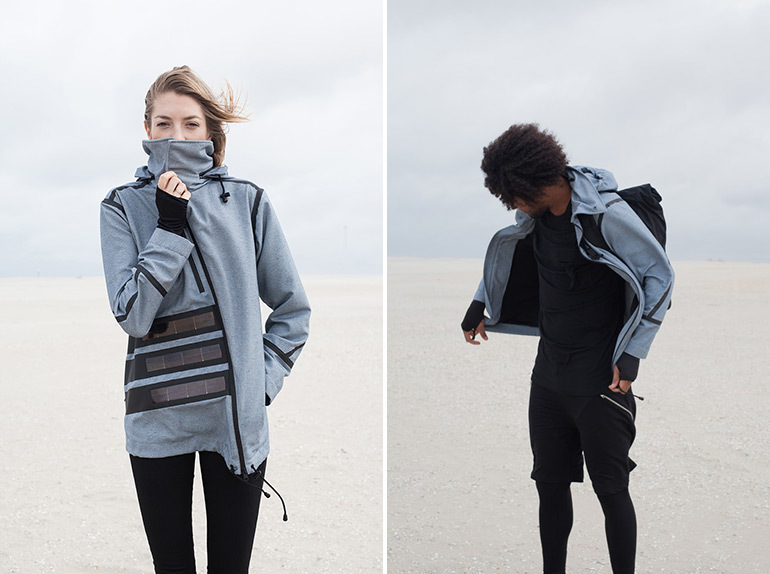 A fashion designer from Netherlands Pauline van Dongen, in collaboration with another Dutch brand Blue LOOP Originals, has designed a jacket with integrated solar panels. 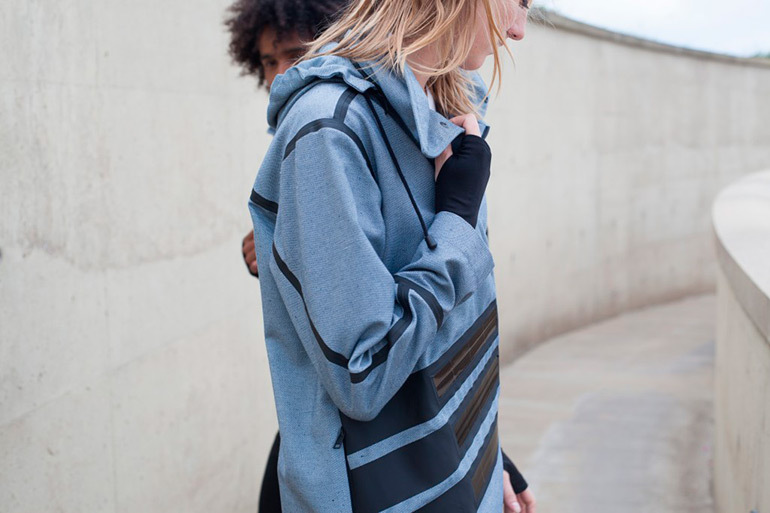 The project titled Solar Windbreaker is the latest addition to the designer’s solar collection that she has been continually building with her studio since 2013. 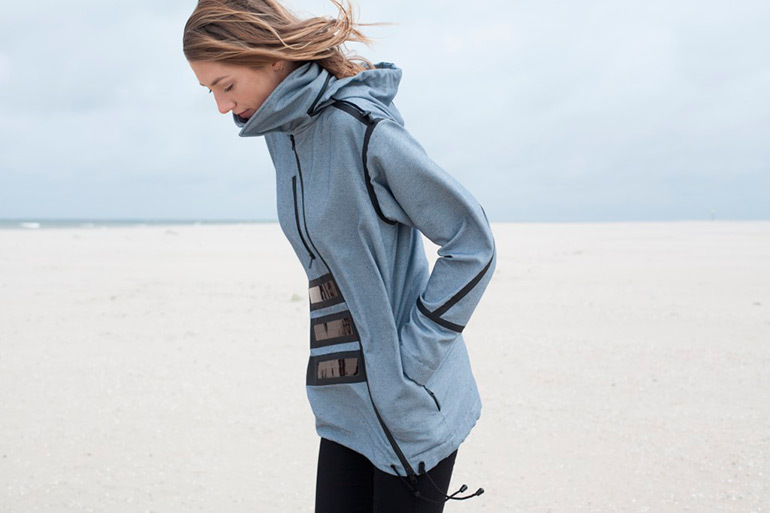 Designed to offer shelter, Solar Windbreaker at the same time provides a wearer with instant sustainable energy. 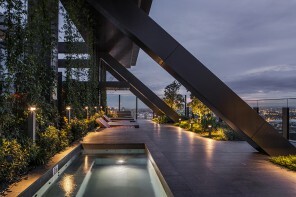 Remarkably, the solar panels also act as an aesthetic feature, forming a distinctive look of the jacket. 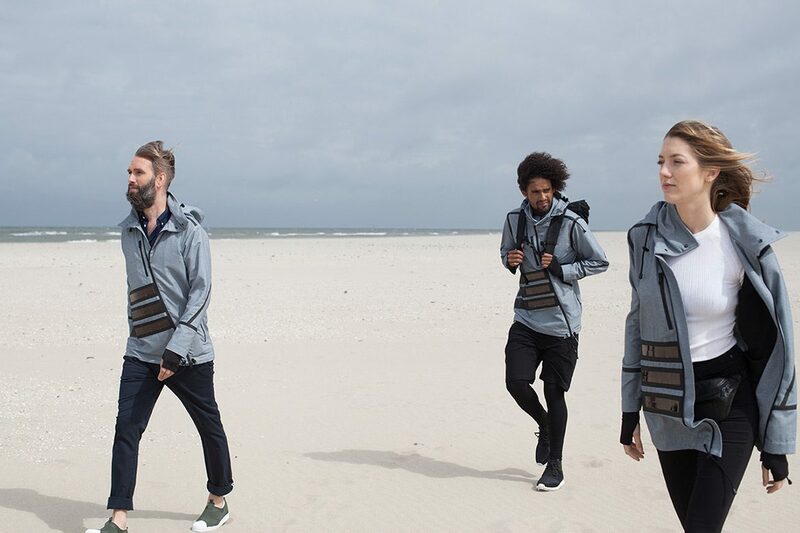 Solar Windbreaker is very practical – being windproof and water-resistant, it also comes with five pockets and a hood, which is possible to conceal behind a zipper in the collar. Striving to minimize the impact on the environment, the designers utilized the upcycled denim by Blue LOOP Originals, combined with recycled polyester and waterproof finish. 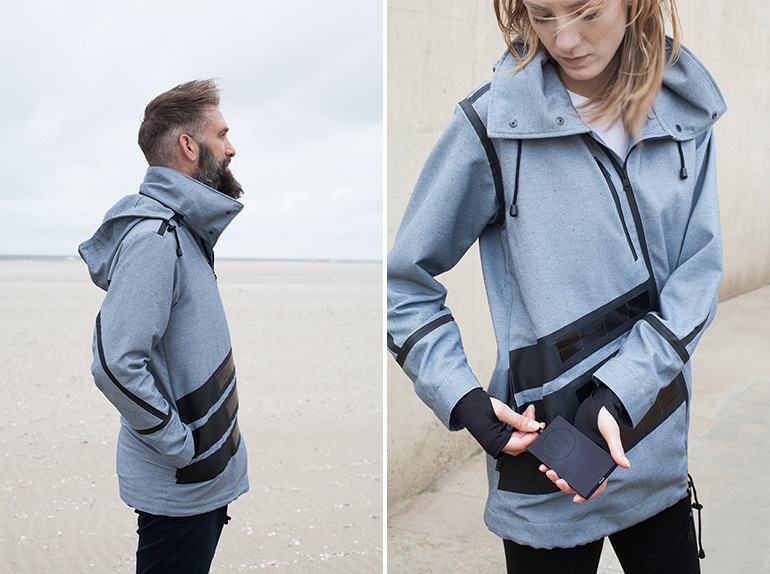 The world’s most efficient, thin and flexible solar panels by Alta Devices are incorporated directly into the front of the jacket. 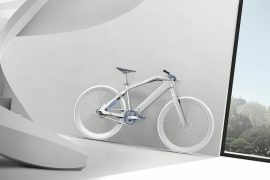 This energy, accumulated in the custom-made lightweight charging module, can charge a typical mobile phone in 1-2 hours, depending on the weather conditions. The charging process is organized via a regular USB cable in the pocket. Moreover, the jacket features the new inductive charging system, so the wireless charge is also available. 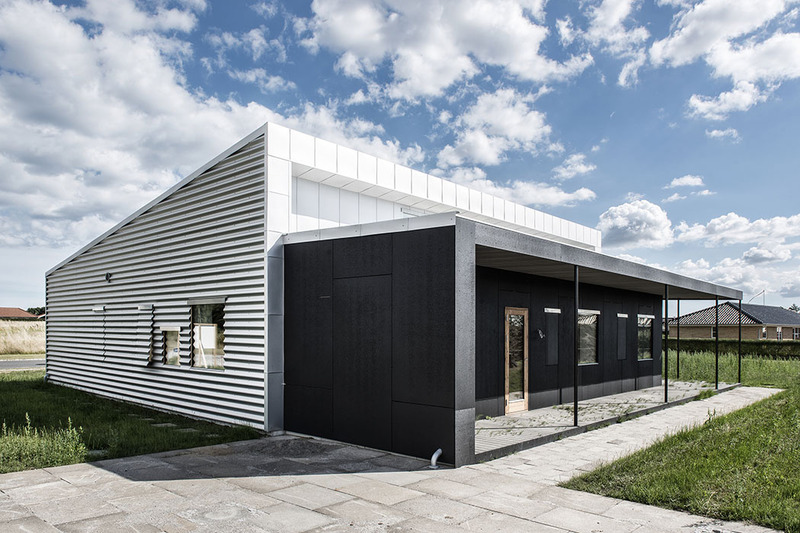 The client of the project is the Dutch organization Wadden Sea Society (Waddenvereniging) that is concerned with protecting the Wadden Sea, located in the north of the Netherlands. The tour guides of the organization, who are also called Wad Walkers, are currently testing the new design during their tours on a soil ground, and with their feedback, the jackets will be improved to make them ready for ordering.